The Netherlands and the Countries to the Left Bank of the Rhine. 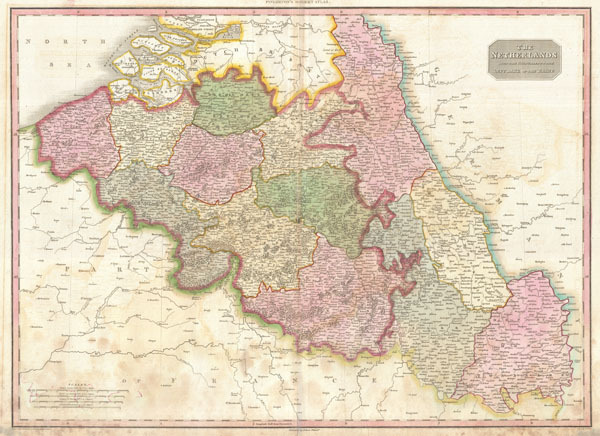 Pinkerton's extraordinary 1818 map of Belgium. Covers what is essentially today's Belgium between the Dutch Brabant and France. When this map was drawn this area was united with what is today Holland under Napoleon and the French Empire. Later the southern parts of the Netherlands, which were traditionally Catholic, would split off to form modern day Belgium. Offers considerable detail with political divisions and color coding at the regional level. Identifies cities, towns, castles, important battle sites, castles, swamps, mountains and river ways. Title plate in the upper right quadrant. Four mile scales, in Common French Leagues, Leagues of Brabant, Dutch and German Miles, and British Statute Miles, also appear in the lower left quadrant. Rumsey 0732.023. Phillips (Atlases) 724. National Maritime Museum, 409.